Welcome to The Club, Nick Binger. Day 3 of Event #57, the $5,000 Pot-Limit Omaha Hi-low Split-8 or Better, saw the final 25 players of a 352-player field return for their shot at the last non-Main Event bracelet up for grabs at the 2011 World Series of Poker. After 12 intense hours, play came to an end with only two players remaining: David Bach vs. Nick Binger. The duo returned on Friday for Day 4 to play out the tournament, and in the end it was Binger who emerged victorious to win his first bracelet and the $397,073 first-place prize. It didn’t take long for things to heat up at the final table; in fact, a big pot developed when Phil Laak was on the button and potted to 52,000, which Bryce Yockey called from the big blind. It was heads up to the flop, which saw Yockey check-call a bet of 48,000. When the was put out on the turn, Yockey check-called another bet, this time 174,000. The completed the board and Yockey checked one last time. Laak thought for a few moments before sliding in the remainder of his stack . . . 527,000! Yockey snap-called only to muck when Laak rolled over for trip threes with the nut low. With that, Laak takes a commanding chip lead while Yockey was reduced to just 328,000. The first elimination happened a short time later when Allen Kessler got all in preflop holding and was up against the of Laak. The board ran out and Kessler was sent to the rail in ninth place for $33,352. The next few eliminations took awhile to develop, but ultimately saw Bjorn Verbakel, Nick Schulman, and Peter Charalambous sent to the rail in eighth, seventh, and sixth places respectively. 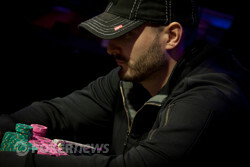 The river didn't change a thing and Laak became the fourth-place finisher, worth $133,377. Not long after, Yockey was sent packing in third place after failing to mount a comeback. That left Bach (3,010,000) to do heads-up battle against Binger (2,270,000). 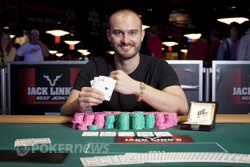 The latter was supported by a cheerful rail that included Michael Binger, Liv Boeree, James Dempsey, Darryll Fish, Matt Waxman, Xuan Liu, Dan Shak, Gloria Balding, Kevin MacPhee, and Jeff Madsen. 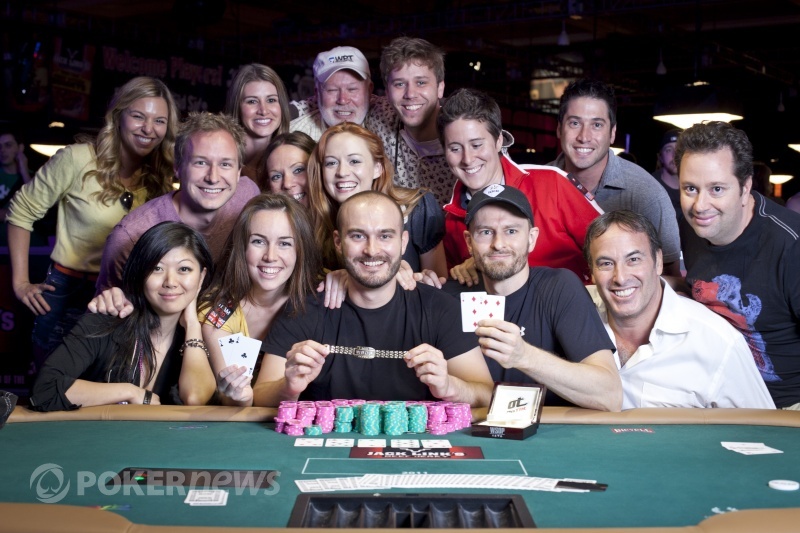 Congratulations to Nick Binger on winning his first WSOP bracelet! That does it for our coverage from Event #57 $5,000 Pot-Limit Omaha Hi-low Split-8 or Better; in fact, this will be the last recap resulting in a bracelet winner until November when the Main Event concludes. With 57 events down, be sure to follow along with our extensive coverage on the Main Event which will be running between now and July 19th. David Bach raised on the button to 300,000. Nick Binger re-raised the pot to 900,000 and Bach came right back over the top with a pot-sized raise, putting him all in. Binger called and the cards were on their backs. Binger was looking for a low flop with clubs and boy did he find it as the flop came down . Binger flopped the nut low and had the nut-flush draw for the high as well. The turn was the and locked up the high for Binger, who needed to dodge a three on the river to scoop the pot. 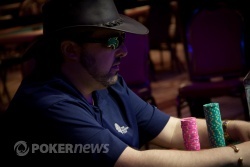 The fell, bringing the tournament to an end for David Bach, finishing runner-up for $245,314. David Bach called on the button and Nick Binger raised to 240,000. Bach called to see the flop roll out . A check from both led to the on the turn. Two more checks brought the on the river. Binger bet 325,000, getting Bach to fold instantly. Nick Binger called on the button and David Bach checked his option. Both checked the flop, landing the turn card. Bach checked it again, leading to Binger betting 130,000. Bach folded and surrender the pot to Binger. The last three pots have gone to Binger and he is now back in the lead. Nick Binger with his fan base. Nick Binger is looking happy. Nick Binger awaits the results of the all in call. Nick Binger, Winner of Event 57.